Rental kitchens and apartment kitchens can be small places, and your lease may limit your decorating options. However, these decorating ideas for rental kitchens take limitations of small spaces and leases into account. People spend an important amount of time in their rental kitchens, although generally speaking the atmosphere isn’t always as pleasant as they wish. If you want to turn your apartment kitchen into the most appealing room in the house, you’ll certainly find the following tips useful. If you can't paint your apartment because of the terms of your lease, you can add color with fabric. For example, reupholstering a chair or stool in an eye-catching combination of color and texture, like orange mohair, is a great option. A simple tweak to make is to change the lighting by adding lamps or merely different lightbulbs to existing fixtures. Edison bulbs look perfectly antique in pendants or elegant in wire shades, and they can provide a warm relief from the light of computer screens that may saturate your workplace. 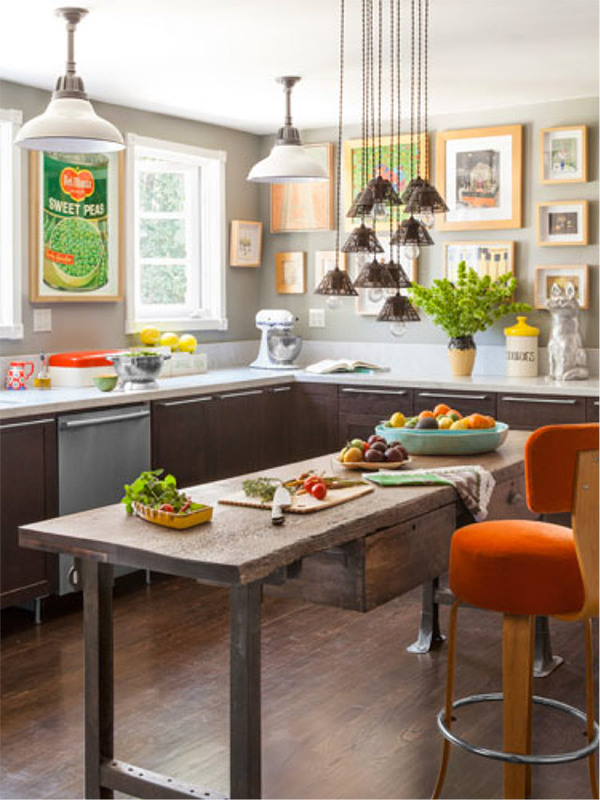 Another way to bring bright touches to your kitchen for little expense is to add artwork. Even grocery ads, menus, and food and beverage labels look like a collection when hung in similar frames. Focusing on ads with one or two colors or those that share a style of typography will add to the impact of your "art collection." 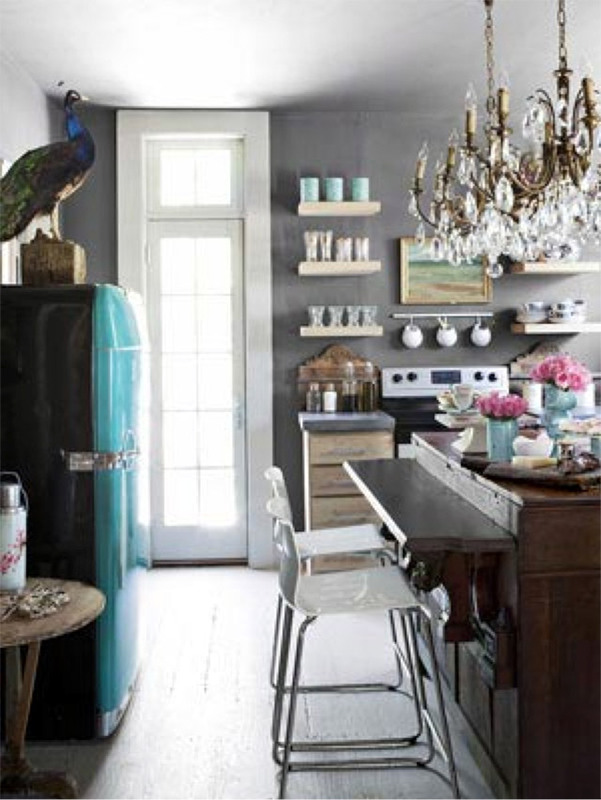 Don’t be afraid to add a colorful vintage refrigerator or a luxurious chandelier in your kitchen. If your kitchen is small, as rental apartments often are, an unusual item can make it look luxe. 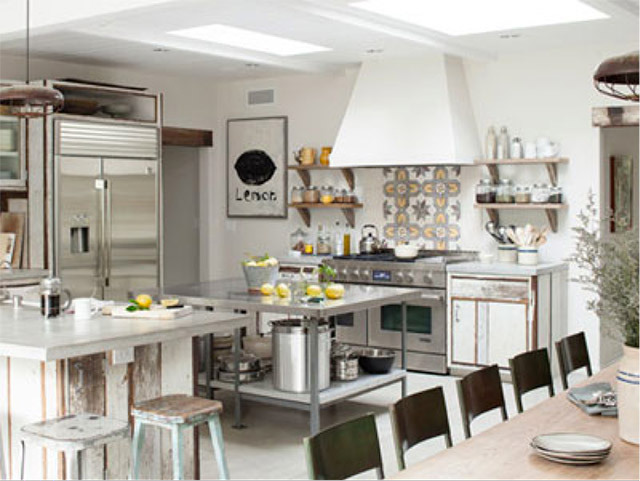 Industrial style is a seemingly undying trend that suits any type of kitchen and can be adopted by everyone. Additionally, industrial style furniture pairs well with most other styles: a juxtaposition of traditional materials like wood with industrial elements like stainless steel seems to bring out the best in both. An old mahogany table looks fresh when paired with metal school chairs specific to the 1950s and with stainless steel elements. Change out your rental kitchen cabinet doors (remember to save the old ones), swap the drawer pulls and handles for industrial style fixtures, or simply cover the cabinets with vinyl adhesive paper. The rustic style is the best option for renters who want to incorporate a touch of the countryside into their apartments or flats. Rustic design elements create a homey welcome for friends and family and can provide a welcome respite from urban surroundings. 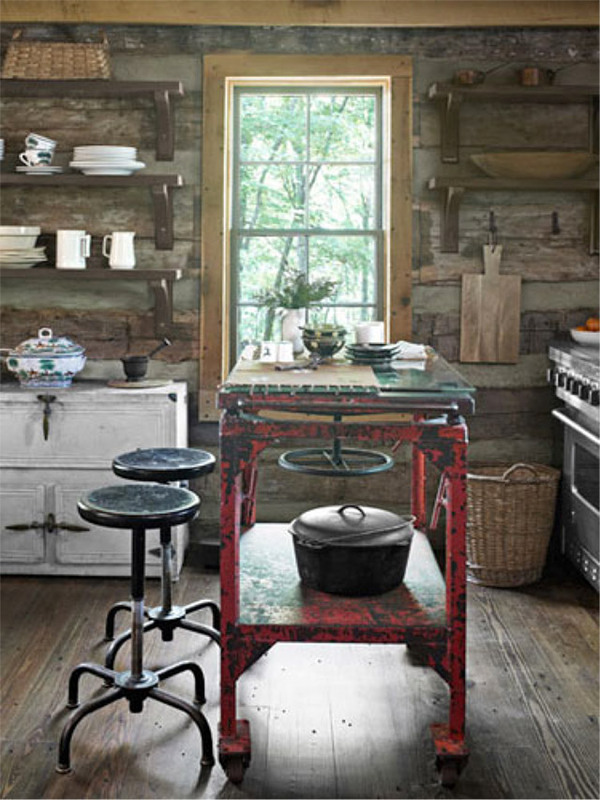 The best part of decorating with rustic touches is that it's easy and affordable: white paint, unfinished wood, and second-hand or vintage accessories and kitchen tools are the principle elements here. When it comes to storage places, open shelves are the best option if you want to achieve a rustic look. Shopping at auctions, flea markets, and antique shows can lead to finds like zinc iceboxes, which provide hidden storage space as well as contribute to a rustic kitchen design. This look is experiencing a surge in popularity and adding a few defining elements in your apartment kitchen decor references an earlier time when family dinners happened daily – a few carefully chosen mid-century modern details will warm your rental kitchen's atmosphere, lending it a gracious air for cooking and entertaining at home. The mid-century modern look lends itself especially well to rental kitchens, which often can't be painted to suit the tenant. 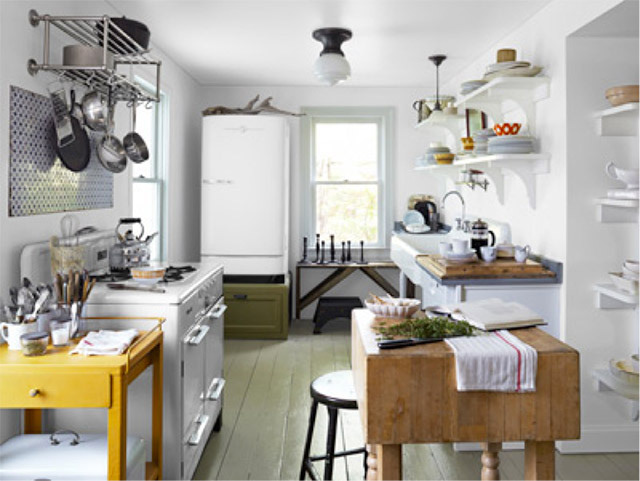 White walls featuring one or two strong pieces of graphic art in period colors or shapes (think sunbursts) will instantly take a rental kitchen from cookie-cutter to "Mad Men." Sticking to appliances with clean lines, finding pieces that marry wood and glass, and choosing kitchen chairs with organic shapes in wire, molded resin, or vinyl (think Eames and Knoll) are simple things to consider when curating a mid-century modern kitchen. Apartment kitchens and rental kitchens are often small or awkwardly shaped. To make your kitchen seem larger, focus on its walls. 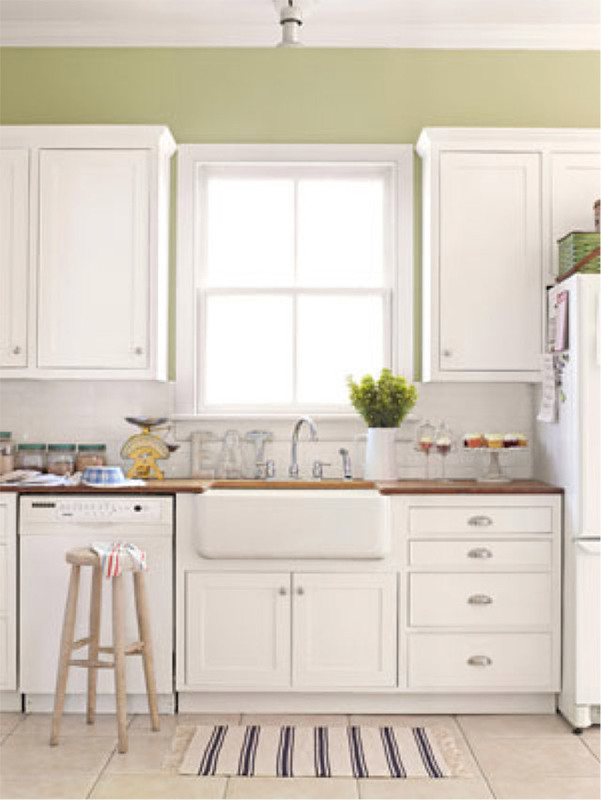 Adding open shelving to walls or removing cabinet doors will make a small kitchen feel less close and constrictive. Additionally, the wall behind open shelving or the insides of the open cabinets can be painted, to augment whatever look you've decided to create in your apartment kitchen. Finally, open shelves and cabinets allow your dishes, mugs, and other crockery to contribute to your decor by putting them on display – colorful or period pieces will have an impact when stored in the open. 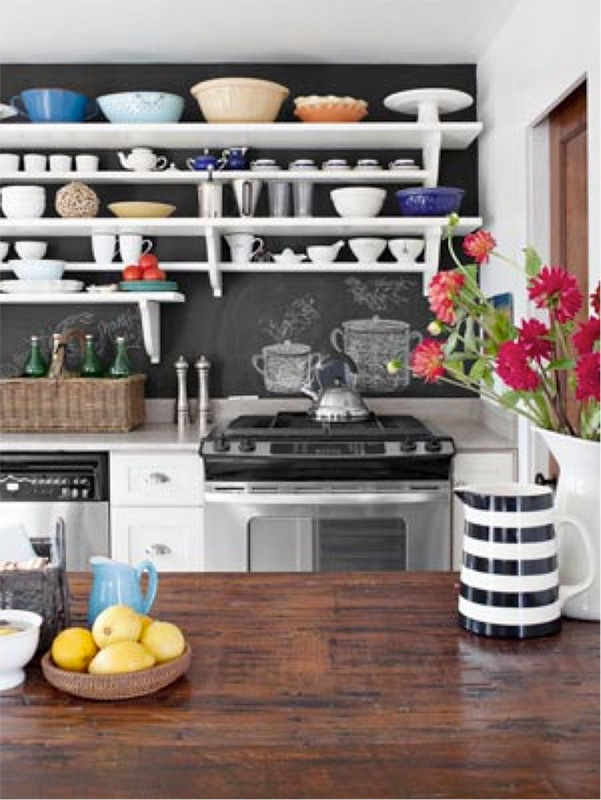 Mounting small shelves above the stove or sink can also add storage suitable for spices and utensils. As well, although the kitchen may seem like an odd place for a mirror, mounting one on a windowless wall can help to solve the problem of a claustrophobic kitchen. Often renters find that they must endure their roommates' choices in decor or furniture. Alternatively, thriftiness and a lack of funds can hamper your plans to redecorate your rental or apartment kitchen. Finally, many renters are young people who may find themselves living with hand-me-downs from parents that fail to reflect their personal style. Fortunately, mixing different design styles can result in an amazing, if eclectic, aesthetic. The easiest approach to making a mix of old and new look cohesive is to find a few unifying ideas (color, texture, mood, moment) and amplify them. For example, a mix of random kitchen chairs or stools will look like a carefully curated collection if you paint them in the same shade (or even complementary shades). Paint is often also the solution to the problem of placing a dated piece in a modern setting – even ornate and dark woodwork looks of the moment when painted in a color popular today. Pieces from different design styles can be inexpensively reupholstered in similar textures, which can also influence your choices in window treatments, artwork, and walls – covering kitchen cabinet doors with fabric is a fairly simple DIY project appropriate for rentals and apartments. 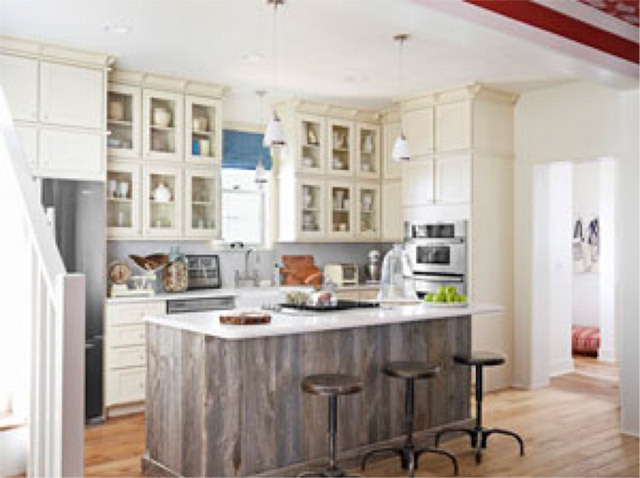 Consider mood when selecting and refurbishing your kitchen furnishings. Because mood can be harder to define than color or texture, you may want to do what many interior designers do and create an inspiration board, or use Pinterest to see other people's. Finally, a unifying principle for your curated kitchen collection can be moment. Think about when you're likely to use your apartment kitchen (early morning breakfast, quick-start coffee, family dinner, date night, late-night nightcap, etc. ), and make your selections based upon creating that moment. The article is authored by an experienced writer William Taylor. He is an interior designer and loves writing about it. His interest leads him to join the interior designing site www.kitstone.co.uk.